Giant grasshoppers were particularly popular subjects for photo fakery during the 1930s. In this image, taken on a farm near Mitchell, South Dakota by an unknown photographer, three men struggle to subdue "the largest grasshopper in existence." 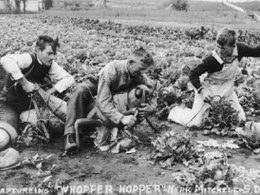 The "whopper hopper" appears to have been a wooden model. 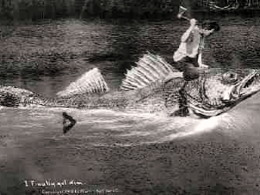 A postcard created by Alfred Stanley Johnson of Waupun, Wisconsin. 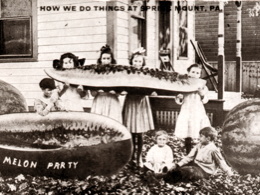 In order to create the illusion of a children's party featuring a giant watermelon, Johnson made the children pose while holding a wooden prop. He then cut and pasted a picture of a watermelon slice into the picture to create the finished postcard. In order to create this postcard of children eating a giant watermelon, photographer Alfred Stanley Johnson used wooden props. Martin made a fortune selling "freak" postcards that featured midwesterners interacting with oversized animals and vegetables.